Walk through the exhibition and see the amazing life size Triceratops, the deadly Dimetrodon, and the friendly Parasaurolophus! These full size beast will take your breath away! We have a host of scale dinosaurs set in realistic scenes so you can see these amazing creatures in their natural habitats! Have you ever wanted to find dinosaur fossils like a Palaeontologist? Then brush through the sand in one of our excavation sites to discover a host of dinosaur teeth, bones and claws! What will you find? Imagine finding the fossilized skull of a Tyrannosaurus Rex from millions of years ago or discovering a rare Triceratops Skull! Get up close and personal with these magnificent beasts – will you put your head in their jaws? Have you ever wanted to sit on a Triceratops, a Brachiosaurus or even the scary Deinosuchus? Well at Dinosaur World you can, but only if you are brave enough!! Take our Dinosaur Explorer Quiz and learn about these amazing creatures as well as having fun – it’s great for all the family and helps every age and ability understand about the exciting world of dinosaurs. And you can win a Dinosaur Expert Certificate! Sit on Derek the Deinonychus and get a special souvenir photo. Taken with professional equipment to ensure a quality souvenir to remember, show how brave you are and snap up a family photo today. – all at great prices. 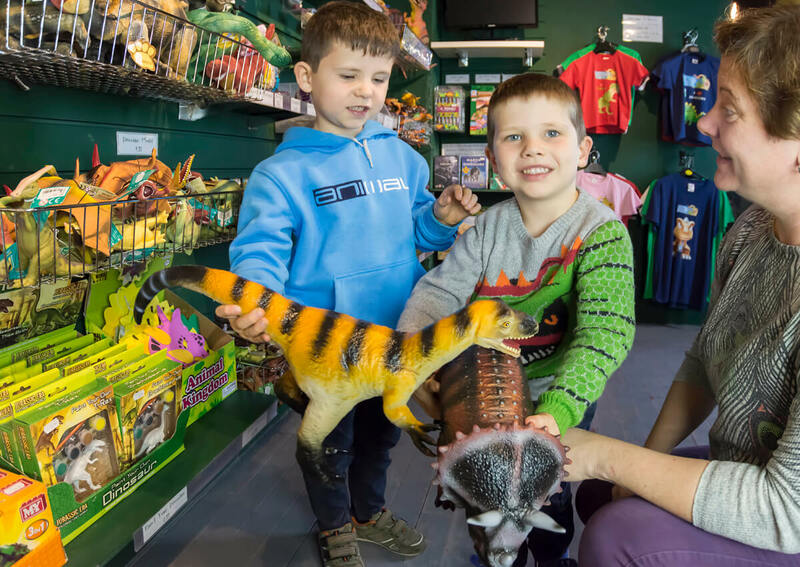 Combine classroom activities with a fun and educational school visit to Torquay’s Dinosaur World so that the children can learn about dinosaurs at the same time as seeing real life displays of these amazing creatures. 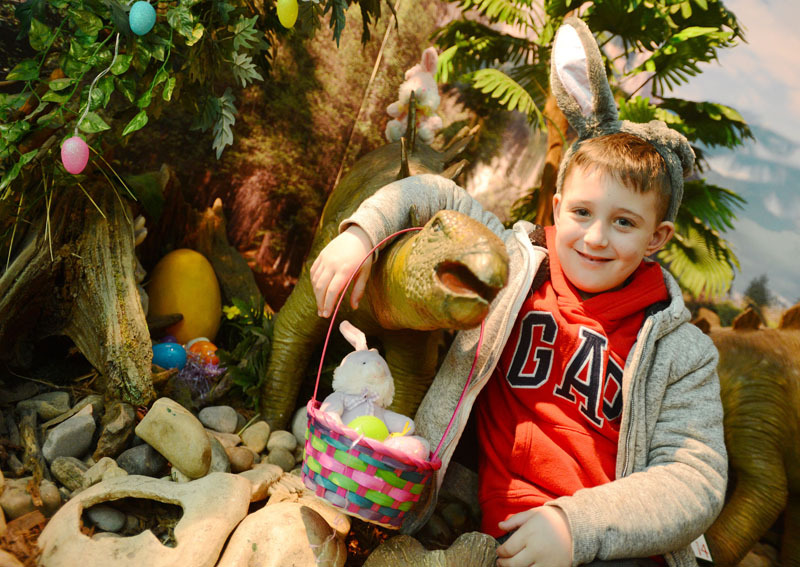 Celebrate your birthday with a dinosaur party at Torquay’s Dinosaur World. You can celebrate with a party during normal opening hours, or with a special private party and have the exhibition to yourselves. 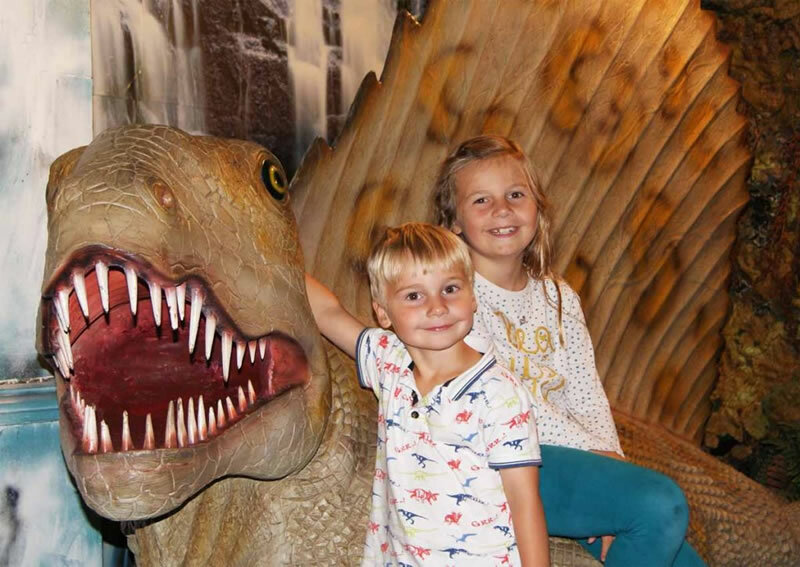 Torquay’s Dinosaur World is a fun interactive indoor exhibition that brings the world of dinosaurs to life. See amazing full size & scaled dinosaurs, discover incredible fossils, learn about these awesome beasts, enjoy our fun Family Explorer Quiz and even sit on a deadly dinosaur. Whether you are a little dinosaur fan, or even a big one, there’s something for everyone to get their teeth into! What's on at Dinosaur World?